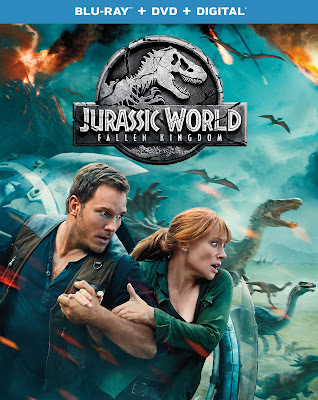 Thanks to Universal Pictures Home Entertainment we have JURASSIC WORLD: FALLEN KINGDOM on (Blu-ray + DVD + Digital HD) to giveaway to some lucky fans. Celebrate the newest installment of the action-packed Jurassic franchise when Jurassic World: Fallen Kingdom arrives on Digital and via the digital movie app MOVIES ANYWHERE on now, as well as on 4K Ultra HD, 3D Blu-rayTM, Blu-rayTM, DVD and On Demand on September 18, 2018, featuring more than an hour of bonus content – including Chris Pratt’s behind-the-scenes “Jurassic Journals” captured on-set. The global blockbuster from Amblin Entertainment and Universal Pictures held the No. 1 spot for four straight weeks at the international box office, and topped the North American box office for two weeks is a worldwide hit, earning over $1 billion in global ticket sales. With the release of Jurassic World: Fallen Kingdom, the Jurassic franchise is now one of the top grossing franchises of all-time grossing over $4.7 billion at the box office. Jurassic World: Fallen Kingdom continues to deliver adventure and thrills with the homecoming of beloved characters along with the introduction of new creatures that are more awe-inspiring and terrifying than ever before.